Enter the letter for hanstamped jewelry. OR number of eggs for mother's love necklaces. Thanks! Introducing my Mother's Love III Necklace!! Celebrating the special love that Moms have for each of her babies! 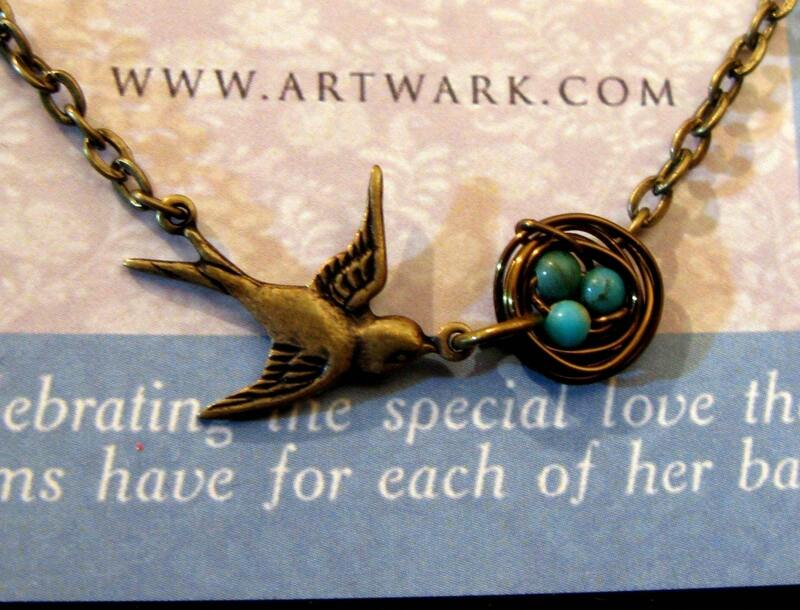 This 3rd edition of my popular bird necklace has a beautiful contrast of 3/4" brass oxidized Mommy Sparrow hovering over her petite 1/2" hand woven nest, nestled with tiny gemstone 'eggs' representing her family!! 16" inches long or custom at request. Lobster clasp. Rich bronzy brass against a popping blue turquoise or stark white rice pearls.